1. In a mixing bowl, cream butter and sugar until light and fluffy. Add the yogurt and 1 Tsp vanilla. Beat well. Combine the oats, flour, salt and baking soda; stir into the creamed butter & sugar mixture. Press two-thirds of the oat mixture into a greased 9×9 -inch baking pan. 2. In a saucepan; combine the condensed milk and carob chips. Cook and stir over low heat until the carob chips are melted. 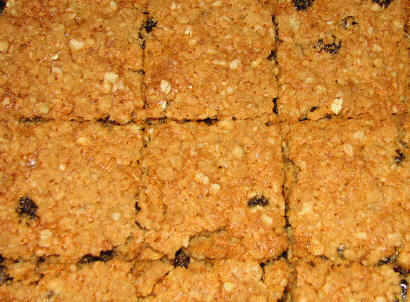 Remove from heat; stir in the raisins and remaining 1 Tsp vanilla. Spread over the crust. Sprinkle remaining oat mixture. 3. Bake at 350 F/180 C for 30 minutes or until golden brown. Cool on wire rack. Cut into squares.